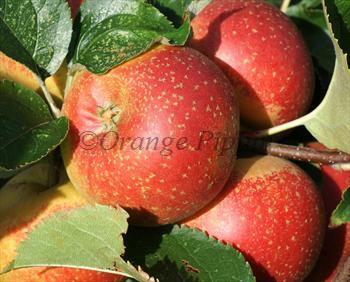 Orleans Reinette is an old French late-season apple variety, first recorded in the 18th century. It is very different from modern apples, being firm rather than crisp to the bite. However it has remained quietly popular in both Europe and North America on account of its rich old-fashioned flavour. Please fill in the details below and we will let you know when Orleans Reinette apple trees are back in stock. Orleans Reinette is in flowering group 4. Orleans Reinette is a triploid variety and cannot pollinate other varieties. It needs to be pollinated by another tree of a different variety nearby. You can either plant a self-fertile variety (which will pollinate itself and the Orleans Reinette) or you can plant two pollination partners which must each be of different varieties and able to cross-pollinate each other as well as the Orleans Reinette. If you need further advice on this just get in touch. Orleans Reinette is a fairly light cropper and grows best in areas with drier climates. Flowering occurs over a longer period than other apple varieties, which makes it difficult to assign Orleans Reinette to a specific flowering group, but it basically flowers in the mid/late blossom season and will therefore be pollinated by most other apple varieties. Orleans Reinette originates from France in the 18th century.